A Sammy Marshall/Kris Arden Globe Acetate! Another rarity today! 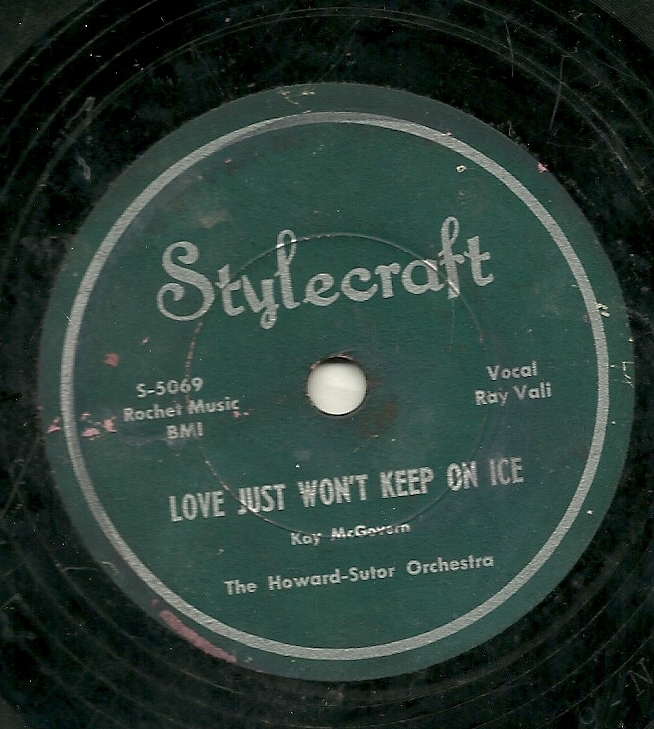 Perhaps not as rare as a Stylecraft 78, or a Cubs song-poem, the combination of which was shared a few weeks ago, but a 78 acetate from Globe isn't all that common, either. That's what I have here. 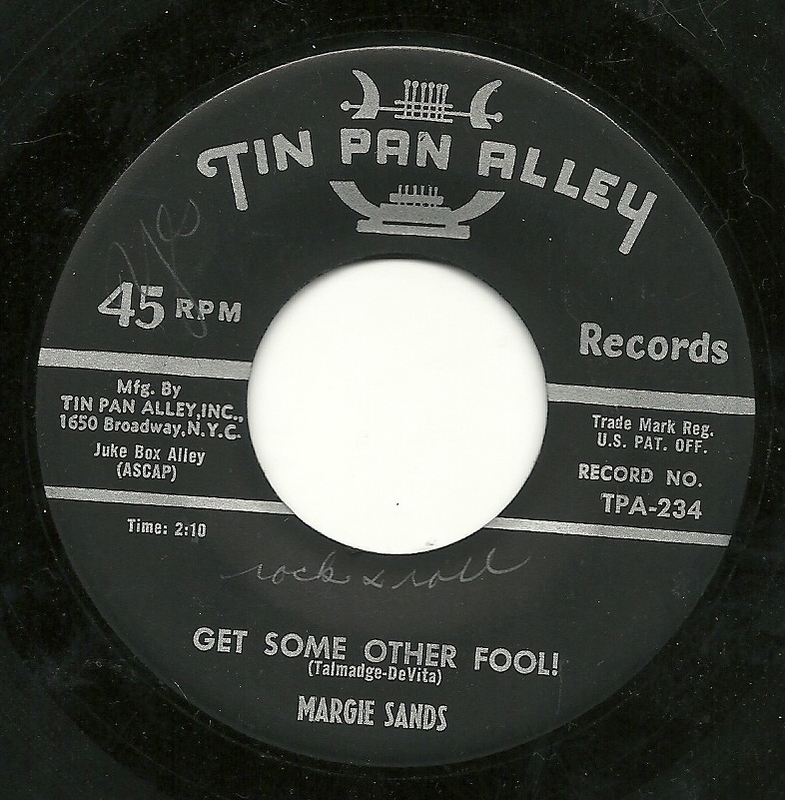 The Globe company released few "records" as such on their own label, mostly limiting their own name to demos of their products on acetates, and putting their actual "releases" out on literally dozens of labels. 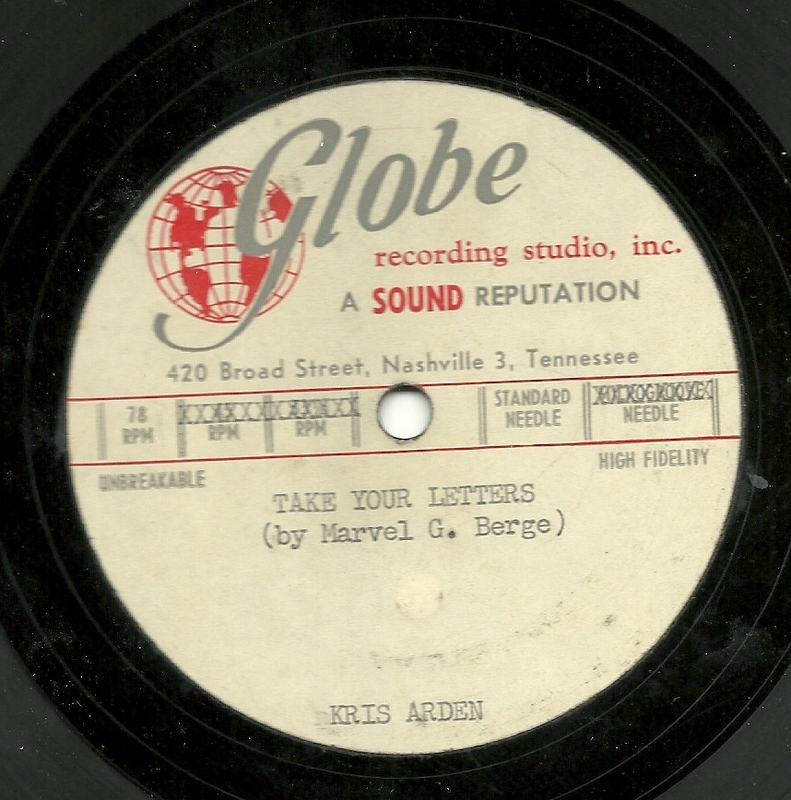 I have several Globe demos, most of them on 45's, and most of those are simple piano and vocal demos. But in this case, we have what sounds like a finished product, and a pair of songs that could easily have found release on any of those myriad labels that they were connected with. 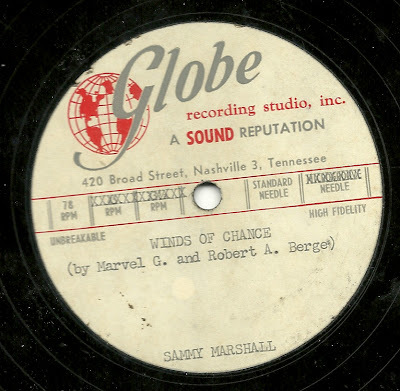 First up is label mainstay Sammy Marshall, and the song "Winds of Chance", a song and arrangement which is a perfect fit for Sammy's talents. There are few elements to this record which give it away as anything but a failed attempt at a hit (mostly a few bum notes here and there in the backing, and some less than inspired lyrics). Over on the flip side is another of those clues to this not being a "real release", that being that the flip is by another artist entirely, in this case Kris Arden. This performance of "Take Your Letters", is, to my ears, a slightly clunkier arrangement and performance of a slightly stronger song than the one Sammy got to sing. I'm not a fan of Globe's reliance on hokey sax solos, however, I am partial to the brief guitar solo here, and a few of the simple, accented fills performed by the drummer, as well as the warm lead vocal. Before getting to this week's offering, I have some big news! This has been long-in-the-works, but today, I can finally announce that the folks at the online Happy Puppy Records label have put together what will likely be the first of a series of compilations of tracks culled from this site. The releases will contain tracks I've previously featured, along with excerpts from my pithy comments on each track, all in one package. The first compilation features a heady mix of tracks by the one and only Rodd Keith, with 20, count 'em 20 big, excellent selections. The compilation can be found here, and there will also be a link to it in my links column to the right of my posts. 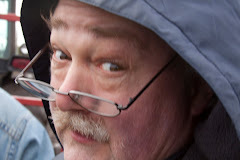 I will provide updates on further compilations as they become available! 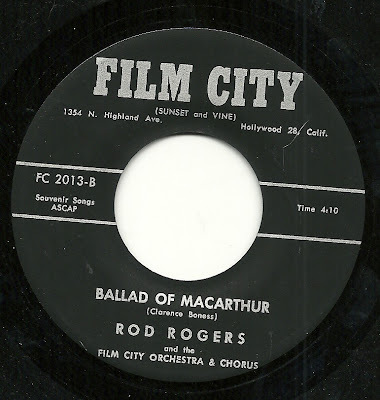 And now, what better way to celebrate this auspicious event than with a Rodd Keith record, in this case in his guise as Rod Rogers with the Film City Orchestra and Chorus. If you listen carefully, you can hear Rod's Chamberlin warming up even as you read these words. It's another patriotic special, a plea for all listeners to "Join In the Fight for Freedom", and Rod has taken on his most patriotic vocal tones, added the Chamberlin's trumpet setting for some stirring fills, an oboe-ish solo, and a quick 6/8 march. Just as your heart begins racing with Red, White and Blue fervor, it's over, lasting just barely 90 seconds. 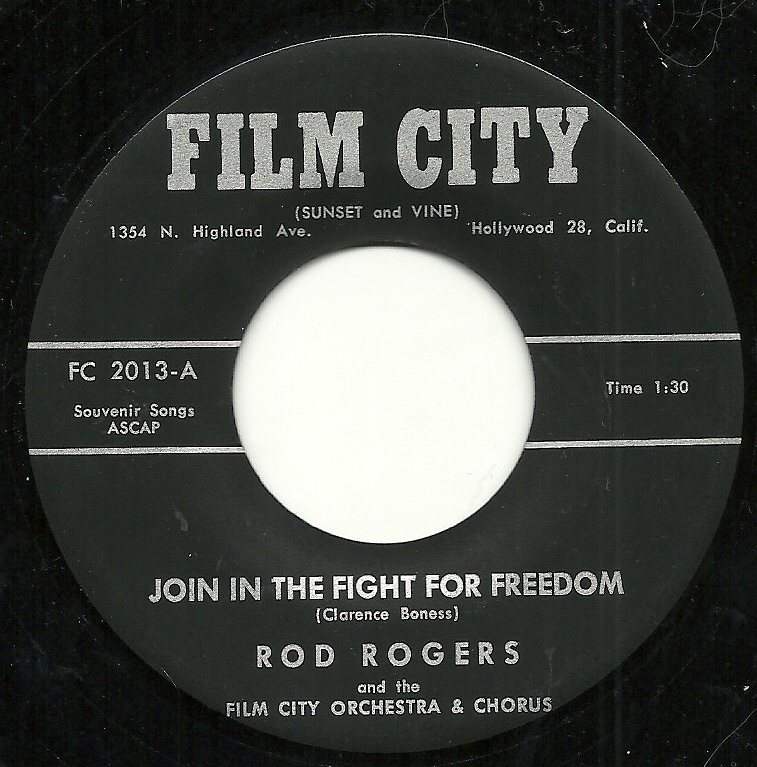 Rodd makes up for the brevity of the A-side, and then some, in providing us with a flip side which is an astonishing (for a song-poem) four minutes and-then-some long. But really, is four minutes too long to tell the story of the life of Douglas MacArthur? For that is what we have here, in "Ballad of MacArthur". Incidentally, I just did a search for that "Film City" address (which is actually nearly a mile from Sunset and Vine), and it looks like there is now a Spa and an "Alphabiotic Balance Center" at that location today. I know most people are calling it baseball season, but that's just because they're not Cubs fans. What a pity for them. ﻿A damn shame, really. And I know that there are 29 other teams, but that's just so that the Cubs have a variety of teams to play. Because IT'S CUBS SEASON!!! And to honor this wonderful occasion, I have a real rarity - not only is this a song-poem 78, the sort of item which doesn't turn up every day, and a record on the Stylecraft label, of which there are really only a handful documented, it's a song-poem ABOUT THE CHICAGO CUBS! Specifically, it's about Hank Sauer, who played left field for the team from 1949-1955. 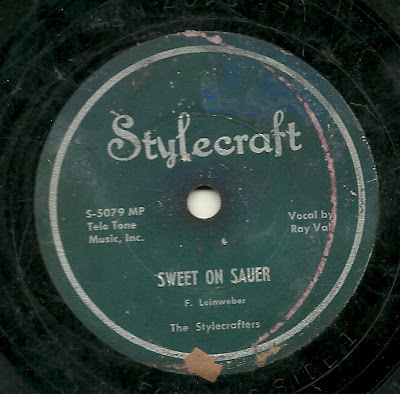 The song is performed by label regulars The Stylecrafters, with the lead vocal by Ray Vali. Among the other unusual features of this record is the way it begins, with a mock radio broadcast of a Cubs game! I actually have some questions about the Stylecraft label, and maybe someone out there knows more about this than I do. Clues as to its status as a song-poem label are almost non-existent - on the AS/PMA website, there are no links to other labels, and there does not appear to be overlap between artists, either. The quality of their productions is considerably higher than that of other labels, and there are few indications from those records themselves that they are song-poems. One of the few clues in that direction here is what I hear as a mispronounciation of "Waveland", one of the streets surrounding Wrigley Field - I can't say I've ever heard it pronounced the way it is here, but that could mean nothing. I would love to know based on what information the label was identified as a song-poem outfit. But.... I've featured songs from the label before, and may do so in the future, and I'm certainly glad that having them identified as a song-poem label allows me to post a song about my beloved Cubs. 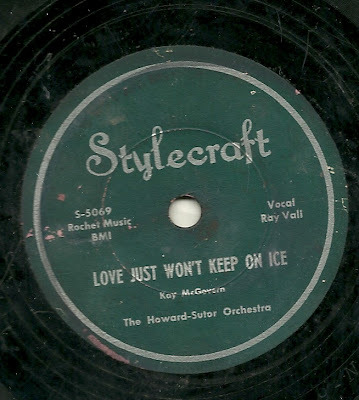 The flip side, "Love Just Won't Keep On Ice", is a pretty standard issue offering for the day and era, performed for us by the same team heard on the A-side. 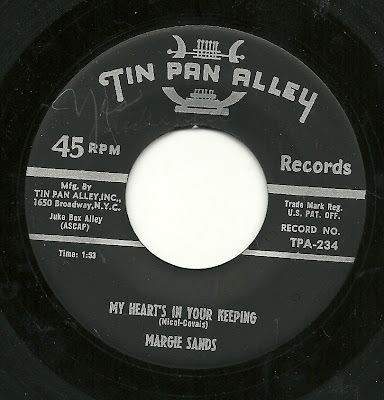 From the flip side, here's Margie Sands again with another one which sounds just right for the time it was released, mid 1958, "My Heart's In Your Keeping"